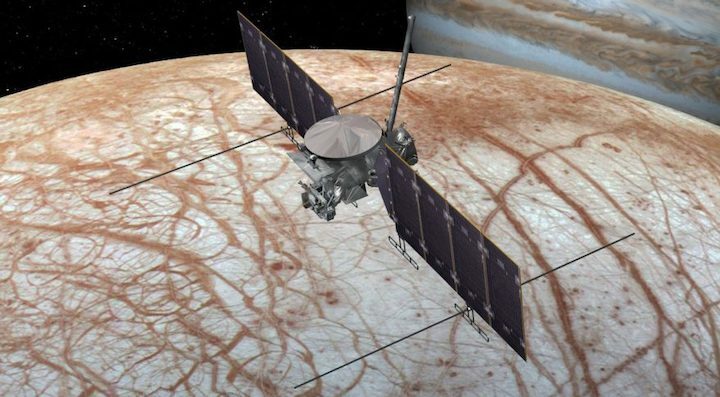 WASHINGTON — NASA has removed an instrument previously selected for the Europa Clipper mission, citing cost growth, but will seek ways to replace it with a less complex design. In a March 5 statement, NASA said that it would no longer pursue development of the Interior Characterization of Europa Using Magnetometry (ICEMAG) instrument, a magnetometer designed to measure the magnetic field around the icy moon of Jupiter. ICEMAG was one of nine instruments originally selected by NASA in 2015 for development for the Europa Clipper mission. NASA said that the increasing cost of ICEMAG, still in its preliminary design phase, led to its removal from the mission. “I believe this decision was necessary as a result of continued, significant cost growth and remaining high cost risk for this investigation,” Thomas Zurbuchen, NASA associate administrator for science, said in a memo. In that memo, he said that ICEMAG exceeded a “cost trigger” last summer that had been put in place for it and other instruments to keep costs under control. That cost trigger escalated reviews of the instrument all the way to NASA Headquarters, including a briefing there Feb. 14. The key problem with the instrument was accommodating its “scalar vector helium sensors,” used to measure the magnitude and direction of the magnetic field. Zurbuchen said in the memo that, at the time of the February review, ICEMAG’s estimated cost has grown to $45.6 million, $16 million above its original cost trigger and $8.3 million above a revised cost trigger established just a month earlier. That cost was also three times above the original estimate in the ICEMAG proposal. NASA will instead pursue options for “a simpler, less complex” magnetometer on Europa Clipper, although the announcement contained few details about how that will be accomplished. Scientists who were part of the ICEMAG team will be invited to remain on the overall mission science team. Scientists consider the inclusion of a magnetometer particularly valuable for probing the interior of Europa, thought to contain a global ocean of liquid water. Data from the magnetometer on the Galileo spacecraft, which performed many flybys of Europa, detected variations in Jupiter’s magnetic field in the vicinity of the moon that scientists said were likely caused by the presence of an electrically conductive fluid, like water, beneath the surface. Scientists had hoped ICEMAG would provide more detailed magnetic field measurements that could constrain the depth, thickness and salinity of the ocean. That would help scientists assess the potential habitability of Europa, a key goal of the overall Europa Clipper mission. Zurbuchen said that NASA was still committed to the overall Europa Clipper mission, but instituted the cost trigger process to manage the mission’s overall costs and avoid increases that could upset the overall balance of the agency’s planetary science programs. “We consider it a critical part of the mission portfolio of NASA Science, and am looking forward to see this development mature towards flight,” he wrote in the memo. The Europa Clipper mission benefitted for years from the patronage of Rep. John Culberson (R-Texas), a House appropriator who became chairman of the subcommittee that funds NASA four years ago. Culberson was an unusually staunch advocate for both Europa Clipper and a follow-on lander, providing funding for the mission far above any NASA request for them. In the final fiscal year 2019 funding bill, passed in February but whose NASA provisions were finalized late last year, Europa Clipper received $545 million, more than double NASA’s request of $264.7 million. In fact, it's not a satellite dish at all. It's a high-gain antenna (HGA), and a future version of it will send and receive signals to and from Earth from a looping orbit around Jupiter. 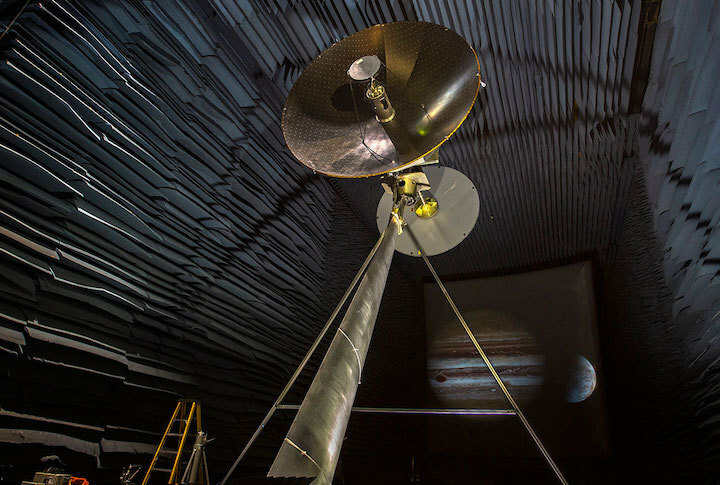 The antenna will take that long journey aboard NASA's Europa Clipper, a spacecraft that will conduct detailed reconnaissance of Jupiter's moon Europa to see whether the icy orb could harbor conditions suitable for life. Scientists believe there's a massive salty ocean beneath Europa's icy surface. The antenna will beam back high-resolution images and scientific data from Europa Clipper's cameras and science instruments. The full-scale prototype antenna, which at 10 feet (3 meters) tall is the same height as a standard basketball hoop, is in the Experimental Test Range (ETR) at NASA's Langley Research Center in Hampton, Virginia. Researchers from NASA's Jet Propulsion Laboratory in Pasadena, California, the Johns Hopkins University Applied Physics Laboratory in Laurel, Maryland, and Langley are testing the prototype in the ETR in order to assess its performance and demonstrate the high pointing accuracies required for the Europa Clipper mission. The ETR is an indoor electromagnetic test facility that allows researchers to characterize transmitters, receivers, antennas and other electromagnetic components and subsystems in a scientifically controlled environment. "Several years ago we scoured the country to find a facility that was capable of making the difficult measurements that would be required on the HGA and found that the ETR clearly was it,"said Thomas Magner, assistant project manager for Europa Clipper at the Applied Physics Laboratory. "The measurements that will be performed in the ETR will demonstrate that the Europa Clipper mission can get a large volume of scientific data back to Earth and ultimately determine the habitability of Europa." Tests on this prototype antenna are scheduled to wrap up soon; however, researchers plan to return to the ETR in 2020 to conduct additional tests on Europa Clipper's high-gain antenna flight article. Europa Clipper plans to launch in the 2020s, with travel time to Jupiter taking three to seven years (depending on the launch vehicle and which planetary alignments can be utilized). JPL manages the Europa Clipper mission for NASA's Science Mission Directorate. The multiple-flyby concept was developed in partnership with the Applied Physics Laboratory.